Everyone arrives on the island of Koh Jum via longtail boat transfer direct from the Ferry, which docks just of the soft sandy shores of Koh Jum. If you have booked accommodation on Koh Jum, it is highly likely that your resort will have arranged to collect you via a longtail boat that will take you right up to their door (or shore). 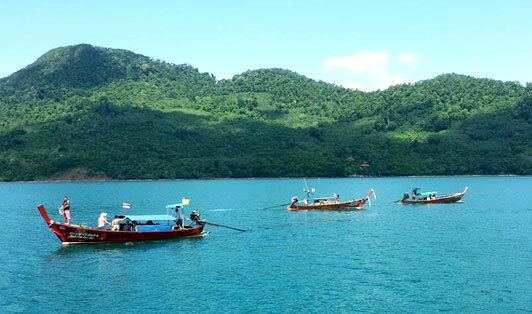 Naturally, the longtail boat transfer is an amazing, but simple experience, and ferry staff will make it easy for you. Be prepared to get wet ankles on your descent from the longtail boat when at Koh Jum's shore, and keep your belongings from dropping into the shallow waters. When leaving Koh Jum, your hotel / accommodation will no doubt have arranged for you to be transferred, again via longtail boat, back to your awaiting ferry. As ferry transfer is the only way to travel in and out of Koh Pu, all the hotels know the transfer routine. 地址 : Southern beach on Koh Jum.